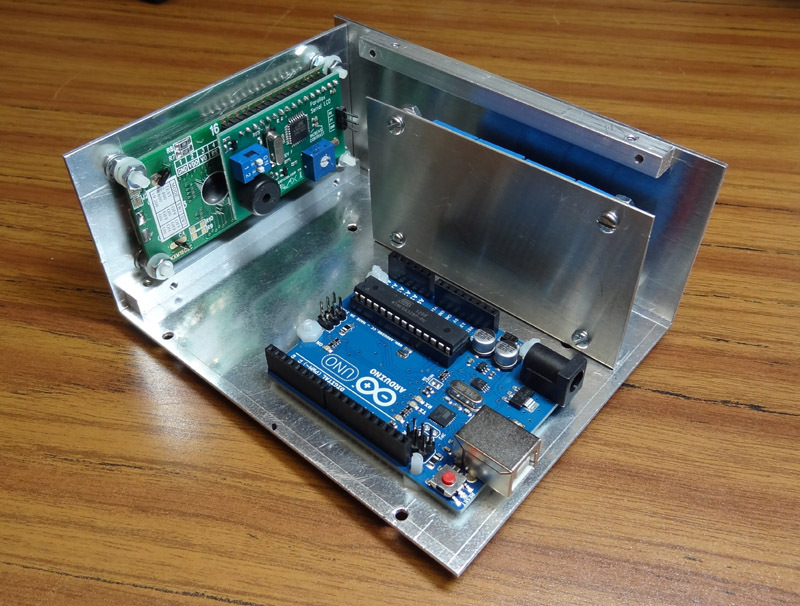 The Arduino series of boards is currently the ideal choice for a satellite rotor controller. This controller uses an extended Yaesu GS-232 command set to control a Yaesu G-5500 Az-El rotor and four SPDT relays. It has both USB and network TCP interfaces that are active at the same time. The four relays can be used for antenna polarity sense switching, pre-amp control, amplifier control or control of any other devices. 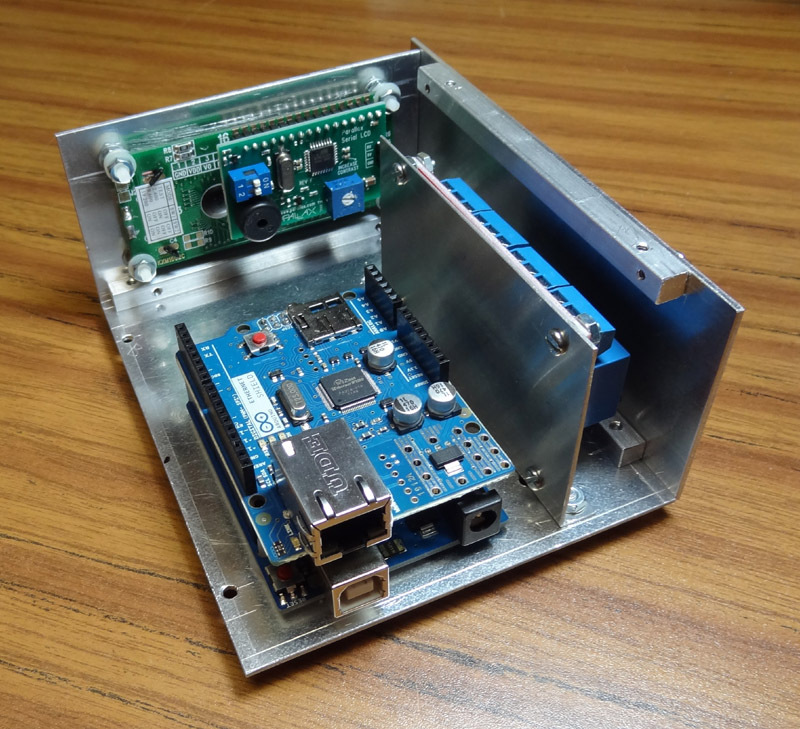 The goal in this project is to integrate the rotor control and device switching into a single device that can be remotely controlled over a single TCP connection or a USB connection. Short video demonstrating the 'Rotor Remoter' used with SatPC32. Best viewed full screen in HD. 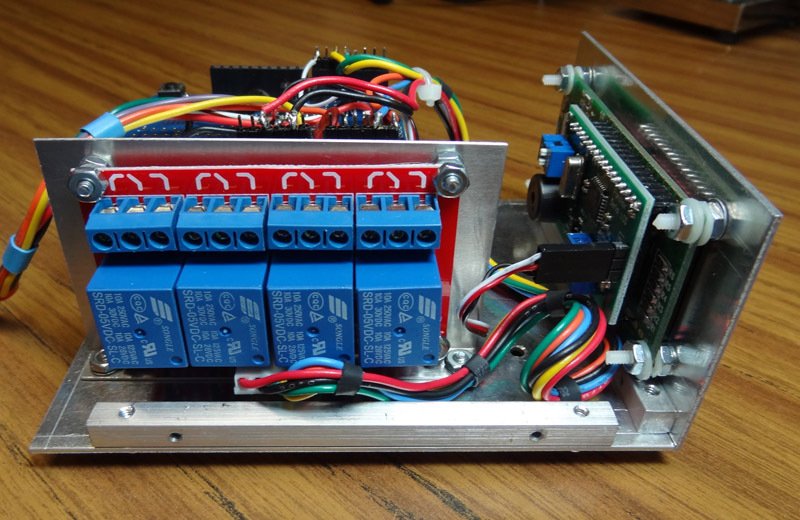 The controller is built up in three layers from Arduino boards. The first layer - The Arduino UNO R3 controller board is shown in the picture below. The back of the Parallax 27977 2X16 backlit serial LCD display is also visible. The USB and power connectors are shown at the back of the UNO R3 board. The second layer shown in the picture below adds an Arduino ethernet board. The standard RJ-45 connector is used to connect to the network for remote control over TCP. If you did not want TCP control this board could be left off. The Ethernet board simply plugs into the Arduino R3 controller board. An 'Arduino Proto Shield R3' is used for the third layer. 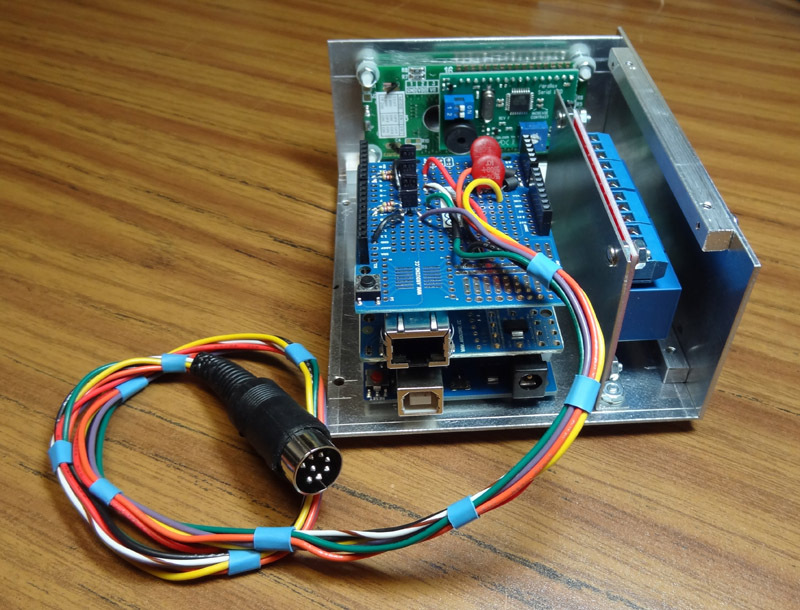 The Arduino proto board simply plugs into the ethernet board. The four NPN driver transistors and the cable that connects to the YAESU Rotor control box are visible in the image below. The 'SainSmart 4-Channel 5V Relay Module' is shown in the picture below. This is an amazing board that sells for only $12 on Amazon. It has 10 Amp relays and led indicators. The outputs are brought out to the convenient screw terminals at the top of the board. 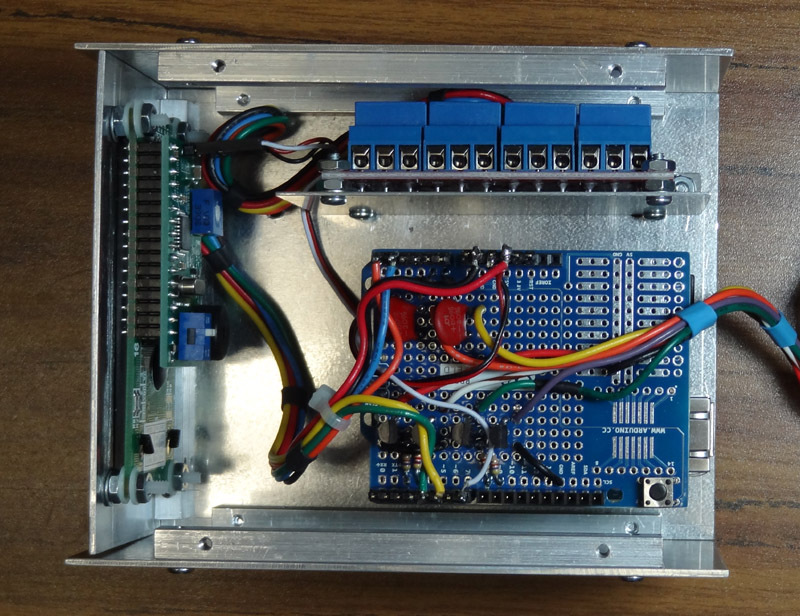 The inputs are driven from four outputs on the Arduino controller. Below you will see the completed controller. The cables connecting the Arduino system to the LCD display and SainSmart relay module are visible. Q: What about a wireless network connection. A: I did almost all the testing with a NETGEAR WNCE2001 Universal WiFI Adapter attached to the RJ45 connector on the Arduino ethernet board. The WNCE2001 is a brilliant piece of gear. It even reflects DHCP requests from its connected devices to your router. This device was designed to allow video games and dvd players to connect to a wireless network. The only setup required is to enter your wireless network encryption password (if you network is protected). It cost $25 on Amazon for a factory refurbished unit. I think the price has gone up to $30. 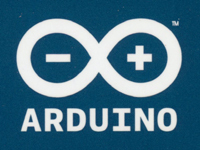 Q: Will this board work with other Arduino processor boards ? A: I have tested it with the Mega 2560 and it works fine. It will work with a UNO R2 with a little mechanical tweeking to the connector pins that does not damage the board. I do not have any other Arduino boards so I can not say if they will work. Q: Where did you get the case. A: I Built the case from scratch. It is a bit longer than it needs to be because it has room for the Arduino Mega 2560 board. Q: Why didn't you use the Basic Stamp chip ? A: The Basic Stamp is way over-priced and under powered for anything other than very simple projects. Even if you don't currently need the additonal power of the Arduino boards why pay much more for much less. Q: Are you going to make Heathkit like instructions ? Q: Why didn't you just buy an LVB Tracker - it has a network interface. A: I bought a LVB Tracker with that in mind. I found that it actually does not have a network interface. You have to remove some chips used for the USB interface and replace them with some sort of board that I was never able to find. The documentation on the network interface was very sketchy plus there was no obvious way to integrate the relay control. I also did not realize when I spent the $200 that the USB and ethernet interface did not work at the same time - shame on me. I really should sell it. This is an old design and is kept for history buffs.